With its clean lines and smart appeal, this three tier twin size bunk bed is aesthetically constructed with sophistication to give your kid's room an instant makeover. Holding a silver finish, this bunk bed features side rails support and slatted base. Made up of metal, this bed has two attached ladder on sides for easy climbing. This space saver three tier twin size bunk bed is designed with precision that easily blends with all styles of kid's bedroom. 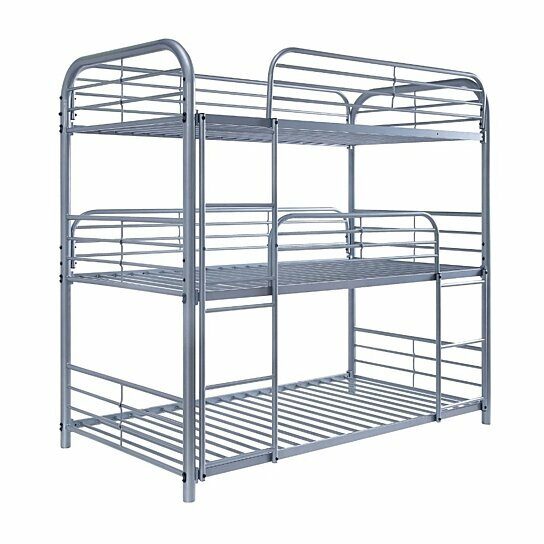 Three tier Twin size bunk bed only. Robust metal construction in silver finish provides a great durable usage. It features side rail support and attached two ladders on sides. Ideal furniture piece for kid's bedroom.